Our stunning Bexley 1.5 Carat Round Cubic Zirconia Bezel Set Solitaire Engagement Ring features a 7.5mm hand cut and hand polished original Russian formula center stone with 58 sparkling facets! 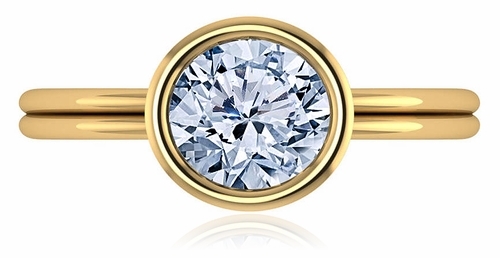 A unique bezel setting perfectly secures the 1.5 carat round simulated diamond and includes cut out portions under the center bezel to allow light in for maximum sparkle. The shank features a unique design element that gives the appearance of a double banded shank. 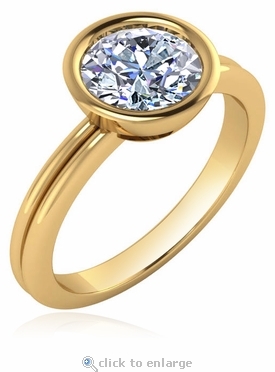 The center bezel measure approximately 9.5mm in diameter and the shank measures approximately 2.5mm in width. 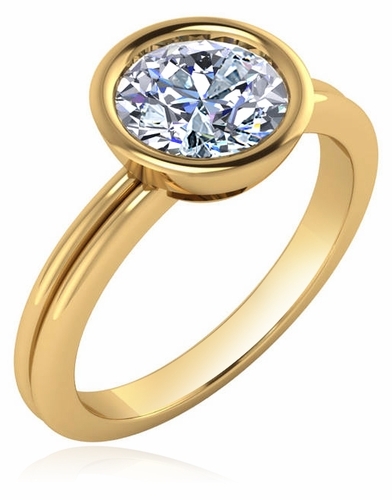 Choose from 14k yellow gold, 14k white gold, 18k yellow gold, 18k white gold and luxurious platinum. 14k rose gold is also available via custom order, please call us directly for pricing. Whole and half finger sizes 5 through 8 are listed in the pull down menu, additional finger sizes may be ordered. For further assistance, please contact us directly at 1-866-942-6663 or visit us via live chat and speak with a knowledgeable representative.